smaller packs, better price, use half the amount! Supporting animal health through nutrition is the underlying reason Eden was founded in 2012, and with the help of our dedicated team we have been able to see many dogs’ health improve, the thousands of testimonials on our dog and cat Facebook groups are evidence to this. Our customer service desk is on hand to provide telephone support and many of the questions are about specific health issues and it was with this in mind, Eden has launched a supplement range. The range is a combination of old and new ideas. Natural herbs and plants have been used for thousands of years to support health, whereas modern supplements are new but very effective. Each of the three supplements contains Ascogen® a high nucleotide yeast extract. Choose from Digestive Support, Joint Support and Skin and Coat in 100g and 300g packs. New improved Eden Skin and Coat provided vital nutrients that promote the condition and vitality of hair growth and skin health. The unique formulation combines the nutritional benefits of Biotin, Zinc and DL Methionine with the cellular regeneration properties of Ascogen® High Nucleotide yeast extract and a range of natural herbs and plants. Skin and Coat can be fed to dogs of all ages that need a bit of extra help with condition. 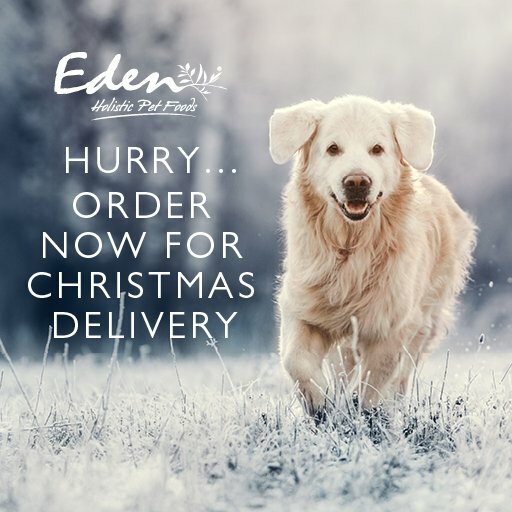 Can be fed alongside the Eden range of high meat content foods or as a supplement to other foods, ideal for dogs who are in the show ring or after a season when the coat can drop excessively. For show dogs that want that extra sparkle in the show ring.